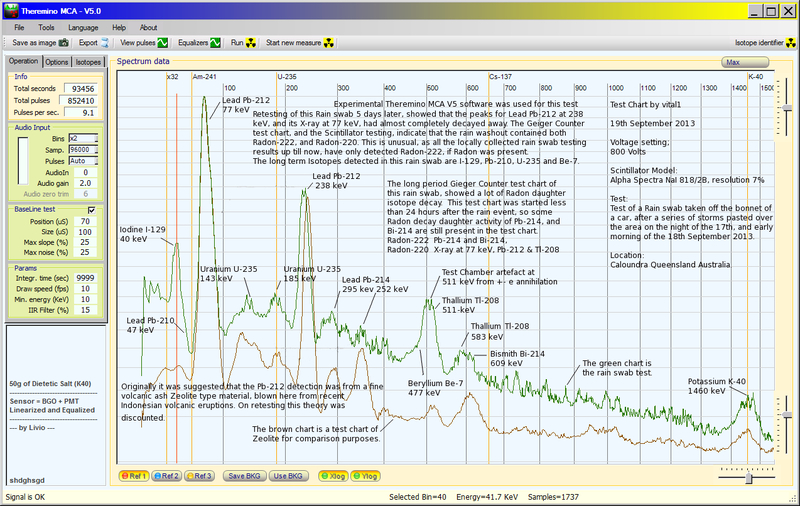 The main peaks are decay daughter isotopes of Radon-220, Lead Pb-212 (238 keV), X-ray at 77 keV, and Thalium Tl-208 (511, 583 keV), plus peaks for long lived isotopes of Iodine I-129, Uranium U-235, Beryllium Be-7, and Lead Pb-210. Because the rain swab scintillator test was started less than 24 hours after it was collected, there are some Radon-222 decay daughter isotopes of Lead Pb-214 and Bismuth Bi-214 also present. Day average background levels have also been very volatile in this area for last 14 days, recently hitting 30% above the pre-Fukushima 4 year average. September 2013 day average chart. Alert Nimbin Monitoring Station report 16th September 2013 – Nimbin is located on the east coast of northern New South Wales Australia. “…Rain began this morning…. drove to town about midday, got home about 30min ago and sat my SBT 10 on the roof of the car, as I gathered my things out of the back seat, and it started beeping. 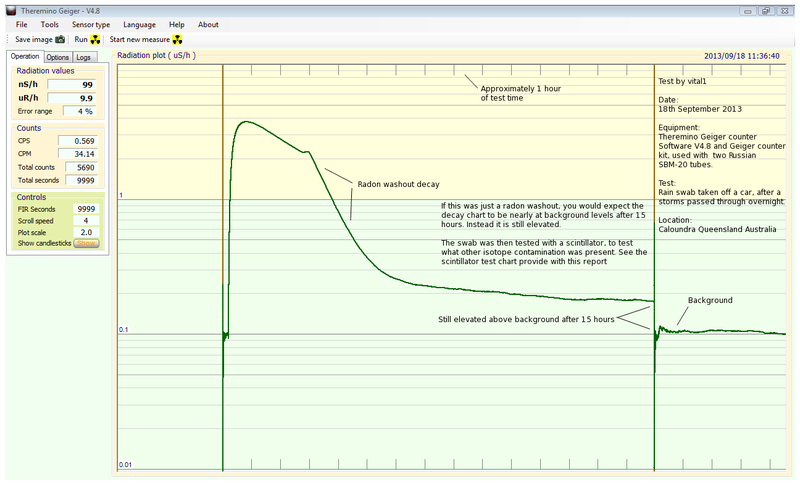 It was reading 0.38uSv/h….moments later I took a swab off the whole car roof (small sedan) and put it to my LND 7317 and got ~6500CPM for the first few minutes. I’ll send a photo and chart soon….” Here is the decay chart and detection photo of this detection, kindly provided by the Ninbim radiation monitoring station operator. NOTE: We haven’t seen any studies on the heath effects of being exposed to large Radon washout events like this. It is only a suggestion to take these precautions in the Rain Alert emails. If you live in the area, it is suggested to stay out of the rain during these events, plus keep children and pets out of it also. If you do get wet, have a good shower. It maybe a very large radon washout event, that seems to be common to the Nimbin area. This rain washout could also have other isotopes in it. Without further testing with better equipment, there is no way of knowing. Another report indicating recent Fukushima releases went far and wide. Day average background levels have been very volatile here the last 11 days. September 2013 day average chart. NOTE: Scintillator testing of the rain swab collected on the 18th September at Caloundra, is indicating the presence of a Zeolite type material. A source of this could be volcanic ash from the recent Indonesian volcanic eruptions. When testing is complete, the full report will be posted here. The scintillator test chart will be provided soon. Preliminary analysis also indicates the presence of trace amounts of Iodine I-129, and Lead Pb-210. “…Rain began this morning…. drove to town about midday, got home about 30min ago and sat my SBT 10 on the roof of the car, as I gathered my things out of the back seat, and it started beeping. 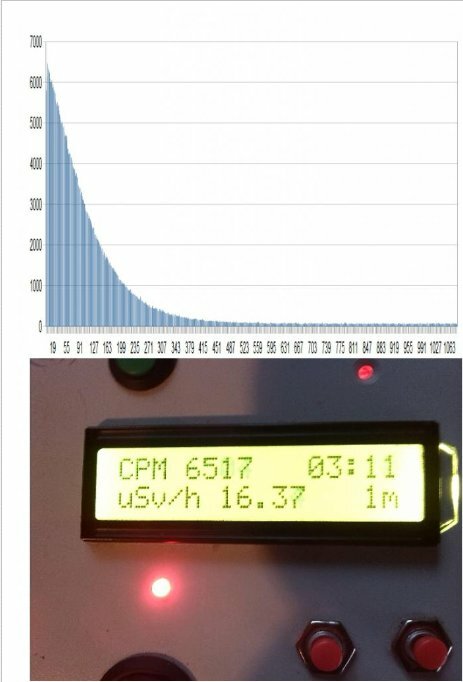 It was reading 0.38uSv/h….moments later I took a swab off the whole car roof (small sedan) and put it to my LND 7317 and got ~6500CPM for the first few minutes. I’ll send a photo and chart soon….” Here is the decay chart and detection photo. We haven’t seen any studies on the heath effects of being exposed to large Radon washout events like this. It is only a suggestion to take these precautions in the Rain Alert emails. If you live in the area, it is suggested to stay out of the rain during these events, plus keep children and pets out of it also. If you do get wet, have a good shower. It maybe a very large radon washout event, that seems to be common to the Nimbin area. This rain washout could also have other isotopes in it. Without further testing with better equipment, there is no way of knowing. Report from Nimbin Monitoring station Queensland Australia September 16th 2013. We haven’t seen any studies on the heath effects of being exposed to large Radon washout events like this. It is only a suggestion to take these precautions in the Rain Alert emails. If you live in the area, it is suggested to stay out of the rain during these events, plus keep children and pets out of it also. If you do get wet, have a good shower. It maybe a very large radon washout event, that seems to be common to the Nimbin area. This rain washout could also have other isotopes in it. Without further testing with better equipment, there is no way of knowing. 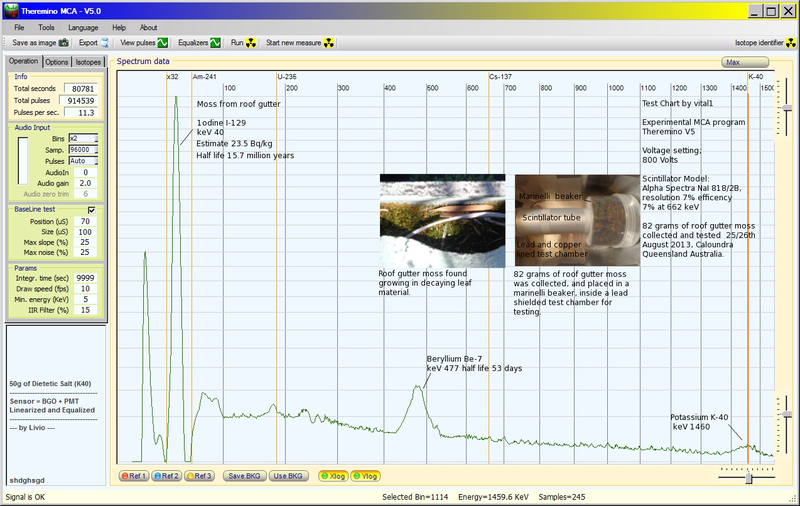 09.09.2013 – Detection of radioactive Iodine I-129 in roof gutter moss Australia. 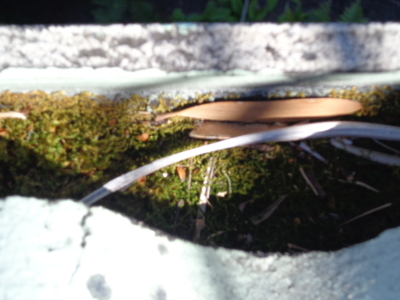 I recently collected 82 grams of moss that had been growing in roof gutter here, and tested it. It was very wet here for the first half of 2013. August has had no rain, so the moss sample was dry. 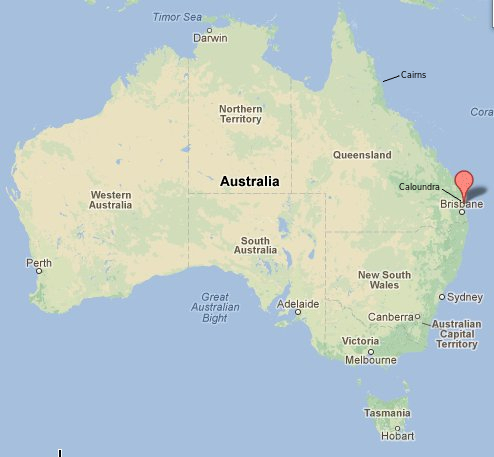 I am located here on the east coast of Australia. 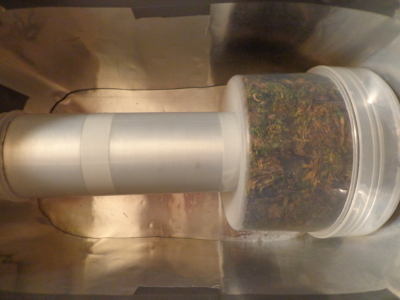 Test chart of moss sample using experimental Theremino MCA version 5. If my assessment is correct, this Southern Hemisphere detection is not a good sign. This is a lot of Iodine I-129. The other possibility is it is Lead Pb-210, or a mixture of both. The main peak is much closer to 40 keV than to 47 keV for lead Pb-210. I have tested this sample with different software, and calibrated a number of times, it very much looks like I-129. This means it is bio-accumulating. So even though our background levels here have not risen a lot, bio-accumulations could present a more serious issue. The moss also had some other material mixed in with it, that it was growing on, leaves and other organic matter. This test result also suggests that there would be more 1-129 in fallout in the Northern Hemisphere. I have discussed this test result with some of my contacts here. Why so much I-129, and not Cesium etc.? The conclusion is because of its volatility. It can also easily volatilize in an environment, as the temperature increases. This would allow it to easily spread long distances, like Iodine I-131. 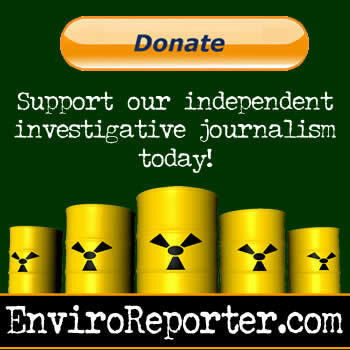 Japanese study of I-129 pre-Fukushima Nuclear disaster. Another pre-Fukushima Argentina study, indicates that Norther Hemisphere I-129, can reach the Southern Hemisphere. This study shows I-129 has migrated from nuclear fuel reprocessing plants at Cape de La Hague (France) and Sellafield (UK). 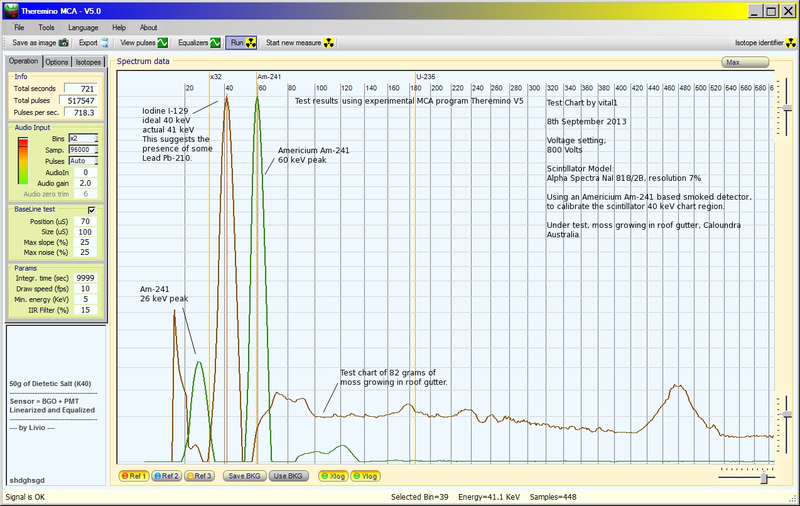 For the technically minded – Testing procedures, and Becquerel activity calculations. I used radioactive Americium (Am-241), from a smoke detector in the test chamber, to calibrate the low energy peak position, and also the scintillator efficiency at around 40 keV. Here is the calibration chart for reference. Smoke detector Am-241 activity = 37,000 cps, from my research approximately 1% of this activity is Gamma. Estimated efficiency at 40 keV is approximately 52%. I used Japanese BecqMoni MCA software to calculate the activity. Using 52% efficiency at 40 keV. This may not be an absolute quantification of the scintillator tube’s efficiency at 40 keV, but we are dealing with moss in a large marinelli beaker here. The efficiency of activity is going to be less than the 52% for the Am-241. So the 23.5 Bq/kg activity estimation is probably conservative.